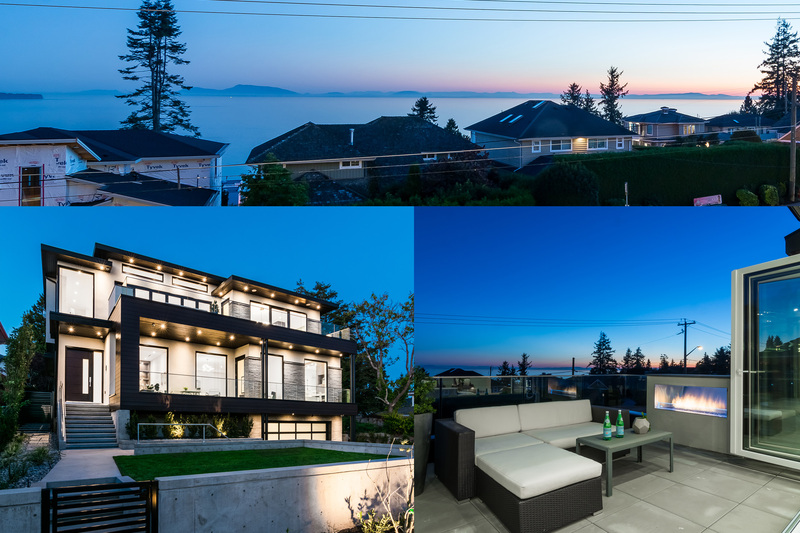 A spectacular ocean view and a tony address would seem to be instant deal-clinchers. 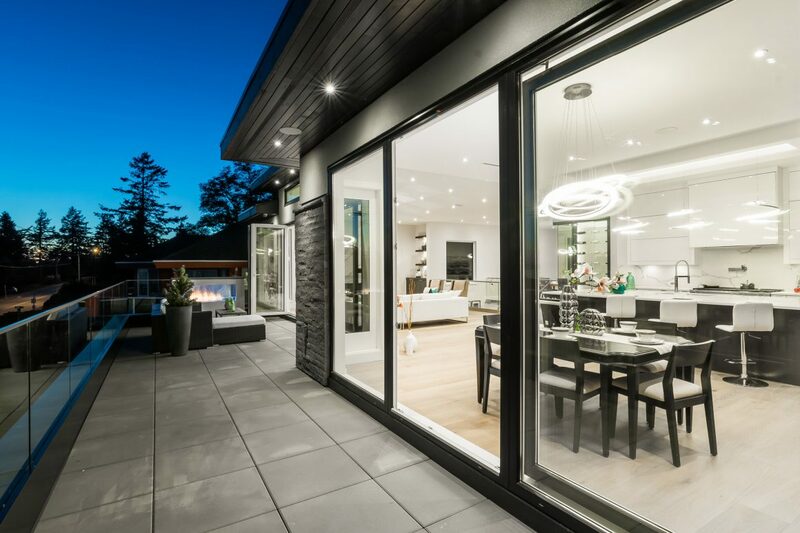 But when it came to the lot that this striking newly built home in South Surrey sits on, builder Jeet Sidhu, owner of Sky Ridge Homes, was not immediately sold. “When I first saw it, the lot was so neglected and overgrown, it was almost impossible to tell if the house would have any view at all,” he says. But his vision and perseverance won out during an ensuing bidding war. After demolishing a dilapidated 1970s-era ranch house, the new structure arose. 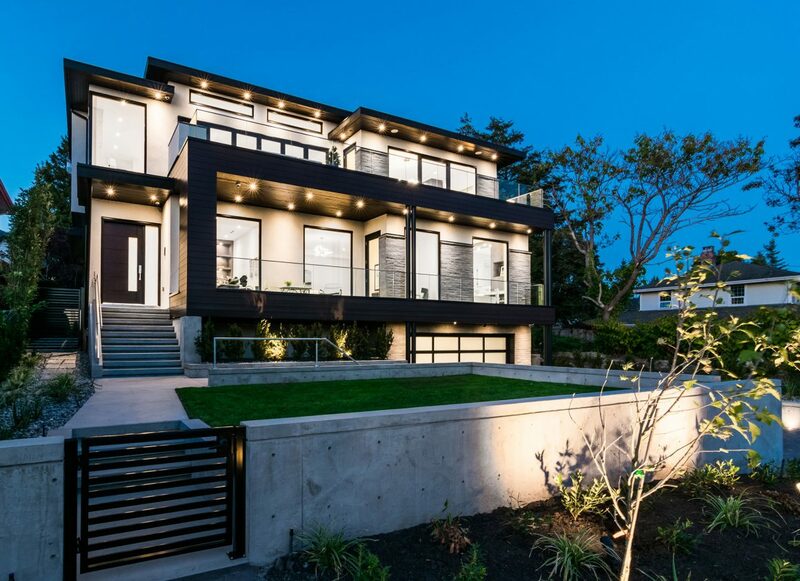 Architects at D Mand Design & Drafting Services deftly employed stone, stucco and long-board aluminum cladding to create a contemporary exterior that fits in well with its neighbours in the upscale neighbourhood. 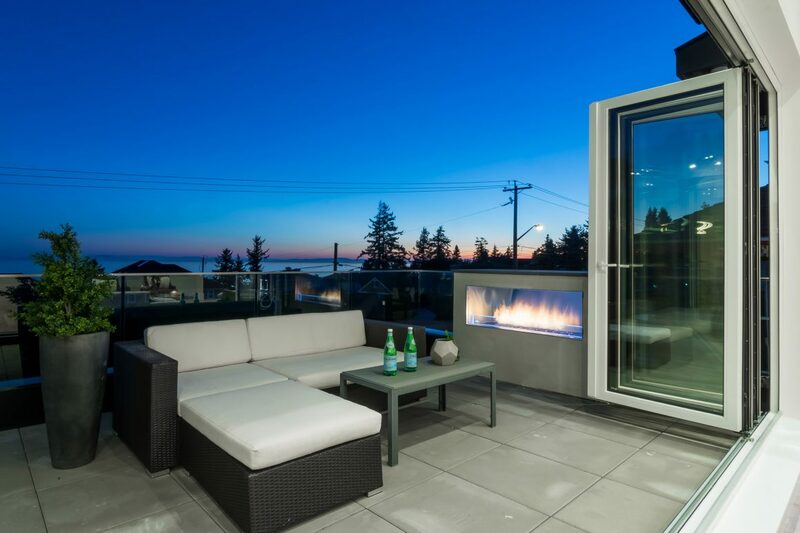 Floor-to-ceiling windows were installed on the ocean side to give a sense of connectedness to the surrounding environment. 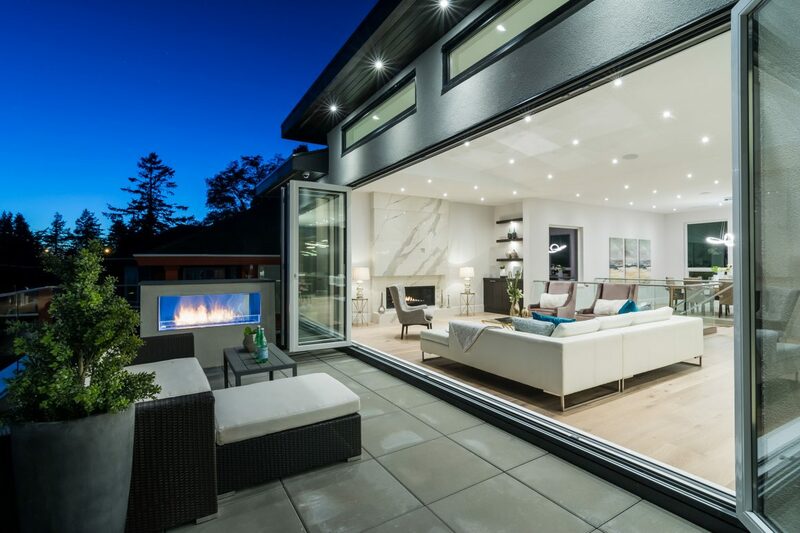 To further enhance the indoor-outdoor living experience, the living area is lined with accordion doors that fold to completely open the home onto a massive 40-foot long deck with outdoor fireplace. The master bedroom on the floor below also lets onto its own terrace. 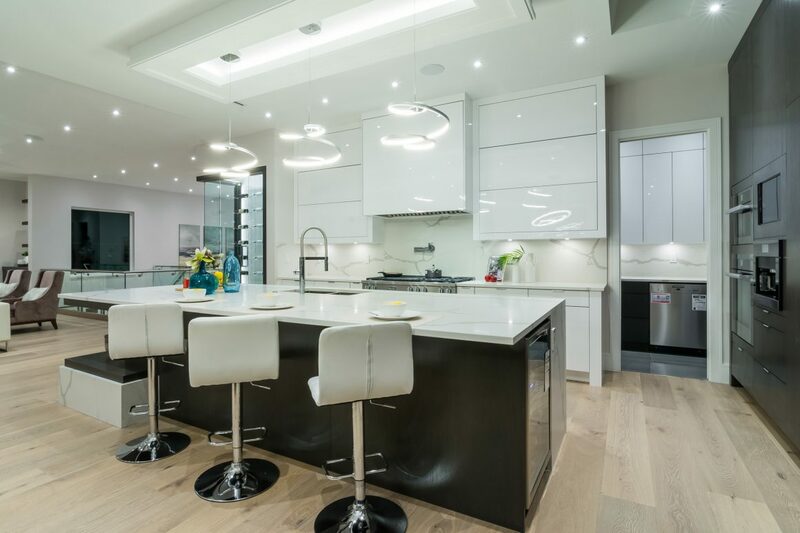 The open-concept great room feels airy and opulent, thanks to clean lines and subtle architectural features. In the living area, the 10-foot ceilings are vaulted. 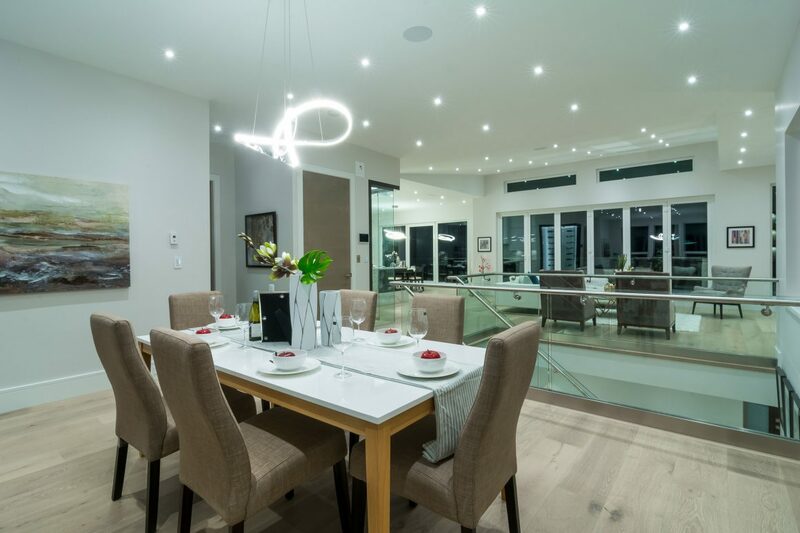 European wide-plank engineered white oak floors run throughout. 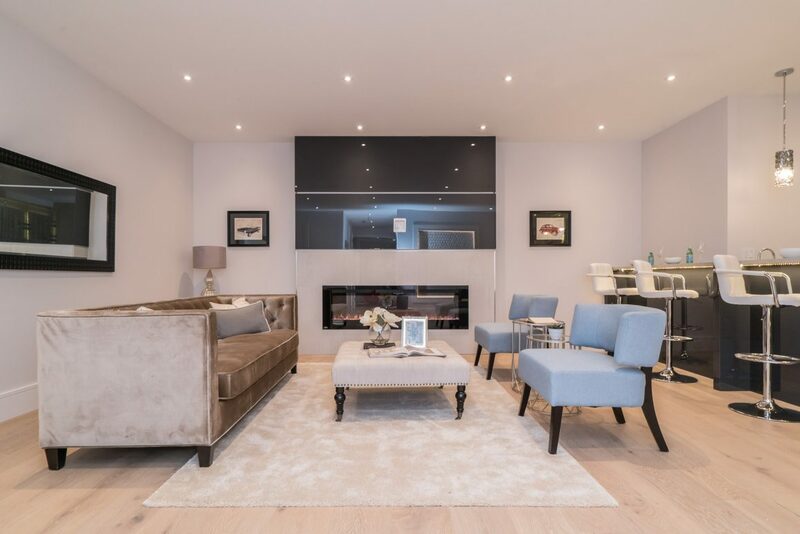 The marble look of the linear fireplace surround extends to the ceiling to create an elegant focal point. 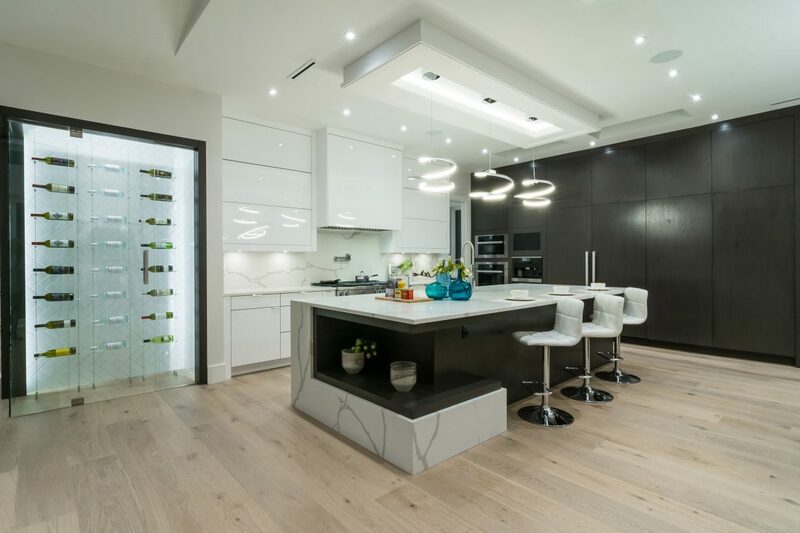 It is echoed in the quartz waterfall-edge kitchen island, to help create a visual flow between the kitchen and living and dining areas. Behind the main kitchen lies a second wok or spice kitchen, complete with range, dishwasher and refrigerator. For entertaining, it also provides a convenient behind-the-scenes area for caterers to work. The wine cellar, usually banished to a basement, here forms a distinctive living room wall feature. “The open style is a big trend now, and meant to be a design feature,” Sidhu says. 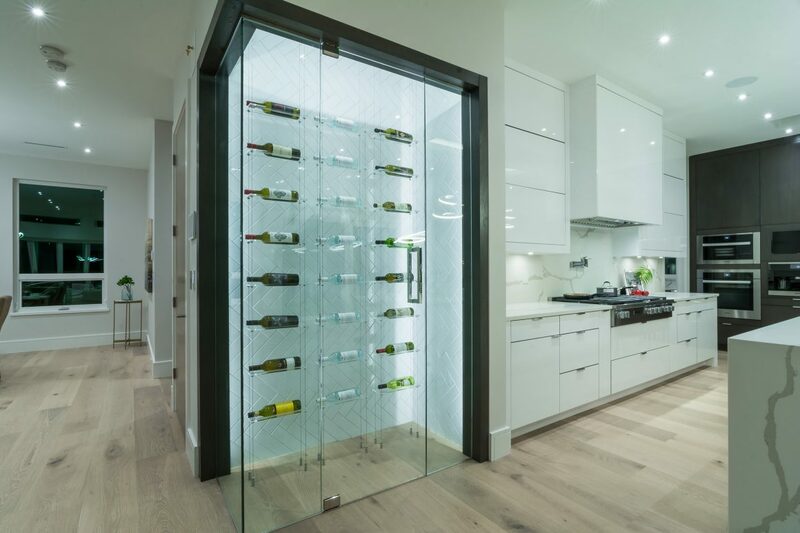 A second similar wine cellar can be found in the basement family room, giving a future owner the capacity to display up to 400 bottles. Four bedrooms are found on the main level; a fifth on the top level could also be used as a guest room or space for crafts. The pièce de resistance, the master bedroom, measures 18 by 17 feet, not counting the massive walk-in closet and spa-like bathroom. 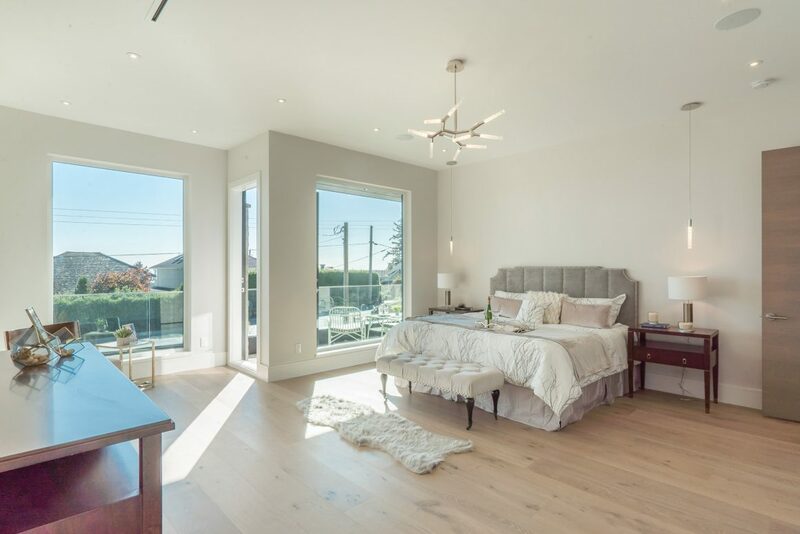 Each bedroom is distinguished by a slightly different design, yet harmonized by a consistent overall white colour scheme accented with shades of taupe. Also on the main level, a room near the home’s front entrance is designed to serve as an office. 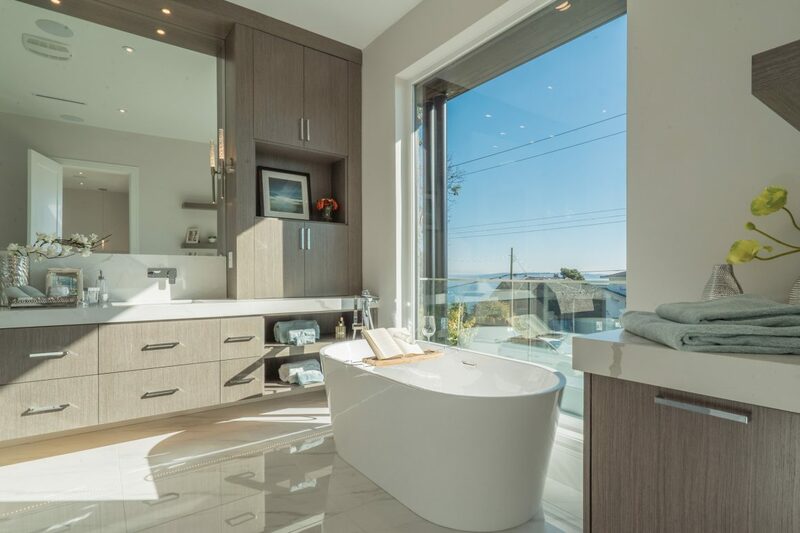 With a powder room off it, it is ideally situated for a professional who receives clients at home. As well, an elevator off the garage and mudroom stands ready to whisk the future owners to the top floor. The home’s basement level offers opportunities for rest and recreation. A fully finished sauna with adjacent shower lies off the home gym, which is equipped with rubber flooring. Nestled between it and the family room and bar area is the media room with its theatre-like ambience, surround sound and a huge viewing screen. 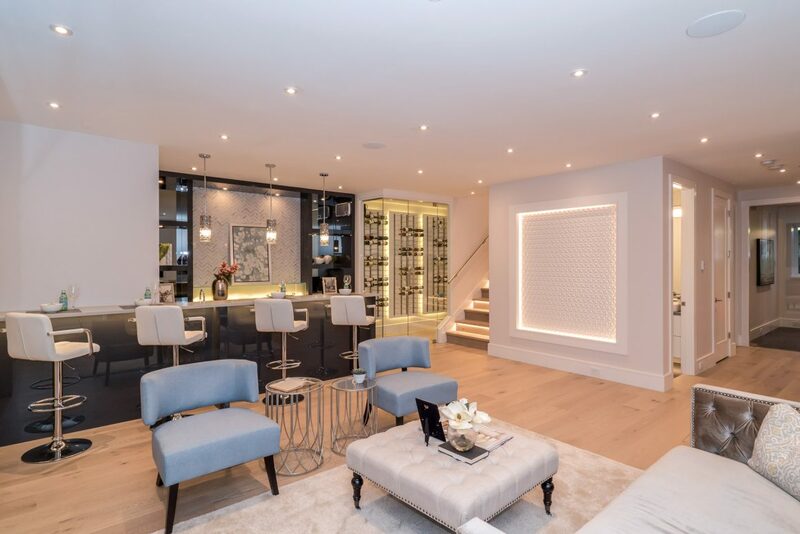 As well, a highly sophisticated smart home system controls video and audio throughout all three floors, while also orchestrating such necessities as security and lighting.